Michael McFadyen's Scuba Diving - Lighthouse Sponge Gardens One of the most underrated sections of the New South Wales coastline is the area around Ulladulla. Located about two and a half to three hours south of Sydney, Ulladulla is a thriving holiday town that also has fishing as a major part of its economy. The small harbour is home to numerous big (huge in fact) trawlers, including giant longliners and seinfishers. The beaches along this whole section of coast are fabulous, as good as any in NSW. 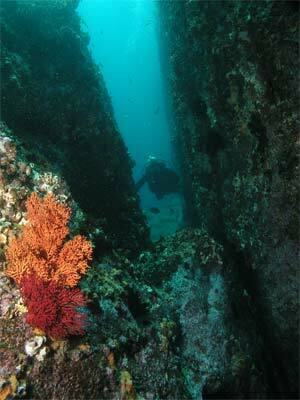 Since 1997 I have visited Ulladulla quite a few times on diving trips. On each of these occasions I have not just enjoyed the diving, I have had a fantastic time. The diving includes the area around Brush Island (The Pinnacle, SS Northern Firth), Crampton Island, Burrell Rocks as well as the area straight off Ulladulla Harbour (Home Bommie and East North Bommie). Straight below the Ulladulla Lighthouse is the Lighthouse Bommie which is a rocky islet separated from the shore by a small channel. This channel is navigable by small vessels in calm weather and looks like it would make an interesting dive in similar conditions. You can do a drift dive right along this section, see my page on Lighthouse Wall Drift. Further off the bommie there is a lot of interesting reef. From Ulladulla Harbour it is only a short run out to the dive site. Head straight out and then veer towards the south and slow up when you get near the Lighthouse. Find GPS co-ordinate (GPS 35° 22' 00"S 150° 29' 37"E - AUS66 Datum - see GPS Page for what this means) and head east or north-east till you find an interesting section. There are sections where the depth drops from 10 to 12 and then over 20 metres. Anchor where you find the best spot. When you descend hopefully you will be on the top of the reef. Head out over the wall and swim along to the north-east. The wall has a lot of gullies, canyons and overhangs. These are filled with fish. After 20 to 25 minutes, turn around and come back along the top of the reef. As I said, there are lots of cracks and canyons on this dive so you should spend a lot of time exploring them. There are sometimes very interesting fish to see in them. Things like wobbegongs and Port Jackson sharks can be seen. Under the overhangs, you will almost certainly see eastern blue devilfish. The walls and gullies have lots of yellowtail, one-spot pullers and silver sweep flowing over from the reef top. In some spots they can be so numerous that they obscure the reef itself. Once back near the anchor, have a look around if you still have bottom time and air. This is a very good dive. The visibility is normally in the order of 15 metres. Water temperature ranges from 13°C in late Winter to 21°C in late Summer. 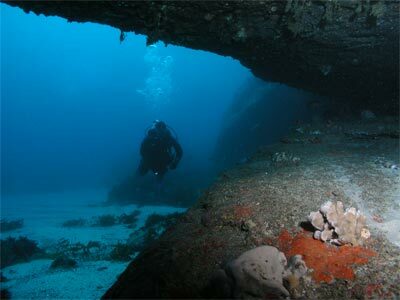 While in Ulladulla I used my own boat to do this dive. We stayed at the local caravan park which is almost in the centre of town and provides cheap, good accommodation with a pool, BBQs and is close to the wharf, dive shop and shops.